Sanya is lined with white sands, surrounded by blue waters and covered with coconut trees making it the perfect place to escape the northern hemisphere’s freezing winter. 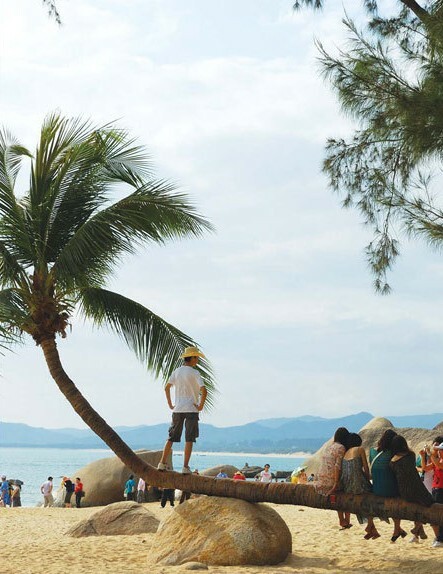 The postcard city is perched on the southernmost tip of Hainan province and has quickly become one of the most popular tourist destinations for mainland residents. Sanya is hailed as "China’s Hawaii" because it shares the same line of latitude and therefore the same all-year sunshine, soft sea breezes, tropical rainforests and majestic mountains. With many kilometers of beautiful coastline, Sanya is all about its beaches. But it also boasts amusement parks, bucolic villages, forest walkways, top golf courses and some of the best hotel resorts in China. 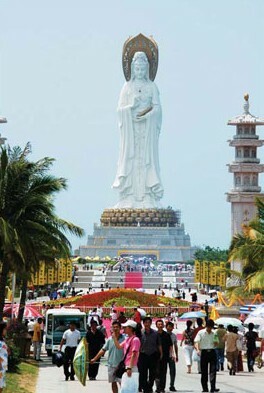 Visitors can view one of the world’s biggest Buddhist statues and also see detailed Buddhist sculptures at the Nanshan culture resort. At this venue, one can witness the traditional lifestyles of some of the island’s 20 ethnic groups including the Li, Miao and Hui. From five-star hotels to roadside booths, the island dishes up the freshest seafood and exotic tropical fruit. Coconuts are everywhere and are the symbol of Hainan island. But buyer beware. Some Sanya restaurants, which display live fish in swimming tanks, charge exorbitant prices, such as 300 yuan (35 euros) per kilogram so ask for the price before you order. 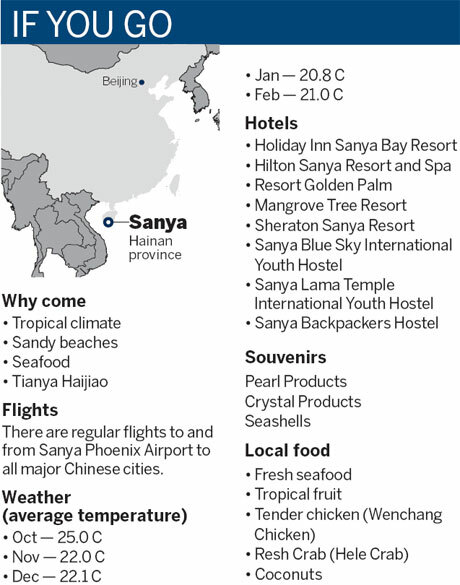 Sanya has become a celebrity itself, attracting dozens of fashion shows and film festivals. It has hosted the Miss World finals five times since 2003, and has been holding the World’s Strongest Man contest since 2006. The city receives more than 10 million tourists each year who are attracted to the seaside and the sunshine. Here are five interesting attractions worth seeing. The bay is situated in the southernmost part of the province and is considered the best beach on the island. Yalong Bay boasts the five essential elements of modern beach resort tourism: Sea, sands, sunshine, lush green plants and fresh air. It is also home to several well-preserved coral reefs with tropical fish of various kinds. The ocean here is crystal clear, allowing visitors to view underwater sights up to 10 meters deep from the surface. Tianya Haijiao, means "edges of the heaven, corners of the sea" and is located at the foot of Xiama Hill in the southwest seaside of Sanya. The cape is often mentioned in many famous Chinese love poems, such as "I will follow you to Tianya Haijiao", which means a couple will never be separated despite the hardships of life. Many newlyweds go on their honeymoons to this romantic spot. The island is located in Lingshui county on the south coast of Hainan island. It covers an area of 1,000 hectares and is a state-protected nature reserve for macaque monkeys. Wuzhizhou Island is a strangely butterfly-shaped landmass north of Sanya in Haitang Bay. It has amazing coral reefs, which are the home to a wonderful array of tropical fish and these natural elements attract many scuba divers. Snorkeling is easy but make sure you apply plenty of sunscreen skin lotion. The tropical sun’s UV rays can cause serious sunburn and ruin your holiday. Sanya is blessed with natural hot springs, which are a major attraction to many visitors and only a short drive from most hotels. There are many different types of pools, from steaming hot and icy cold to special ginseng herbal baths and the fish-nibbling pool. In the fish pool, the fish nibble away at the bather’s dead skin, causing a unique experience.